No clue why I slept so badly. I woke up many times. Still tired I stand up at 8 a.m. and try to reach Mr. Kleinknecht in Germany to manage the transport. He is not there but as it is bank holiday in Columbia it is not important behause there will be no answer at all. After the breakfast I drive by taxi to the BMW dealer. He tells me that rthey “forgot” to mount the rear tyre – unbelievable. I have to wait 30 min. At the end it was more than an hour before I can leave their ground. My next destination is the equator, but not the city of the middle of the earth but the museum Intiñan 240m far from there. It shows the history of the indigenous. Until 50 years ago it was still normal to have a trophy of a shrinking head of your enemy. The next interesting point was a palm that is used for hallucinations. You take a pice, cook it for 10 hours and have finally at least 12 hour hallucinations. Various stations show some specialties of the equator, e.g. the water flow on the northern and the southern hemisphere. Beside this your capability of balancing is not give on this line. And your weight is 1kg less than in our regions. Wonderful! On my way back to the hostel I get completely wet. Luckily my trousers I gave to the laundry is ready, so I can take the bus to the old city center with its churches. In the Basilika Del Voto Nacional, the biggest neo-gotic church of America has space for 10.000 people. But I don’t like the interior. 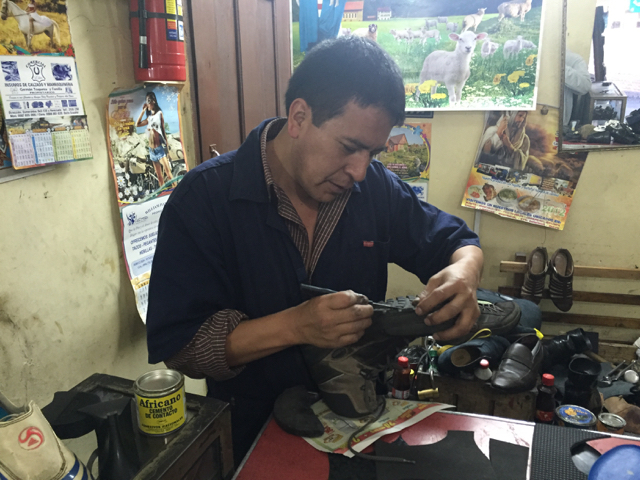 A nice shoe maker sews my hiking boots for $4,- professionally. This should last till the end of my trip. I got the confirmation from Mr. Kleinknecht for the costs by air to Frankfurt US$3.100,-. The advantage is that I have got Flecha already in Germany for the summer. And no troubles with the customs in Cartagena. By taxi I reach „Capilla Del Hombre“, a nice museum of the artist Guayasamín, who died here in 1999. Beside paintings that are mostly about death, pain, horror, fright and hope, you can find sculptures and as well in his house a huge collection of pieces from allover the world. The tour through the museum was one of the best I have ever had. After more than 2 hours I leave this place and take a taxi to the TeleferiQo, Quito’s cable car that brings me from 3.100m up to 4.100m within 8 minutes. Unfortunately I am a bit too late because it is getting very dark and some minutes after my arrival it starts to rain. Immediately after I was back to the valley station a lightening hit the traf and all has stopped. Happy of not being captured in the cabin I spend the rest of the afternoon in a café. After Halsmost 2 weeks I have to get my stuff sorted. My right case is not tight and hence it got wet inside and I have to dry it first. Then I’m heading to Otavala. The street is sinuous and after 40km really nice. Reaching Otavala I park next to the arts market and take a break in a café. I bring some balloons to the little daughter and play with her. So nice to see such glittering eyes. It starts to rain again and with my rain gear I reach Iberra where it is much warmer and sunny. Finally I drive around the lake Yahuarcocha (lake of the red blood) And stay a night at Finca Sommerwind (www.finca-sommerwind.info) at Hans and Patricia. Probably the last time I build up my tent. It’s 6 a.m. when I got awaken by rain drops. These get more and more and I have no hope that the tent can dry before I leave. At around 11 a.m. I’m on my way to the border. Normally it would be very easy but at the end it took me more than 2 hours including buying an insurance (SOAT) for Columbia. From here it is Code to the church Las Lajas Sanctuary. When I arrived there it starts again to rain. So, I take the obligatory pictures before I’m heading to Pasto – again in my rain gear. The officer at the border warned me already against the striking farmers who block the roads. I’m glad that they opened the road just 5 minutes after my arrival. Allover you can find police and military, but all are very friendly and greet me always. The street is great and at 5.30 p.m. I reach the Plaza de Nariño in Pasto. First I need an ATM, then an accommodation. While I stand in the street a man asks me what I’m looking for. Once I have told him that I search an economic hotel he said he will be back in 3 minutes. Indeed he comes back but with no good news: due to the blockades there is no hotel available, but I want I can stay at his home. He has the same bike that I have and biker should help each other. He gives me the address and 10 minutes later I’m speechless. Dario invites me to his huge house with a big garage and a beautiful guest room. After taking a shower we drive to a nice restaurant and he invites me for dinner. Unfortunately his nice wife Doris cannot join us. What a great experience! Alba, the housekeeper, serves me a wonderful breakfast. Then I book my flight to Germany for July 3rd and after lunch I say good bye to them. They are so nice. Thank you! Then I drive to Popayán. Dario has checked before that there are no blockades on my way as well as he has booked a hotel room for me in Popayán. Again and again I pass gas stations with the sign “no gas available”. And the ones who have some left sell it 30% more expensive. From time to time I pass a toll station. Luckily there is a separate line for motorbikes with a fee. Great! I reach the hotel Toledo easily and after a shower I do a little ight-seeing. Due to the many white buildings the city is called the “white city”. Suddenly a man comes to me asking me where I’m from and if I have foreign money for his sun who is collecting money from allover the world. We talk for a while and as he is police inspector he can give me a lot of hints where to go and where not. A very nice evening again with a wonderful person. Beacause I don’t get breakfast in my hotel I walk through the city and find a shop with „Ensalada fruta“. It is not what I’ve expected because it is with ice cream and chocolate chips. Anyway, it was good. In the afternoon I get a tour through the house of the family Valencia who has still a huge influence in this city as well as in Colombia. At 10 a.m. I start with direction to Salento in order to see Alex the last time in South America. But I have not left the city when two car drivers stopped me at a traffic light telling me that the street is closed and no gas will be available there. I have to go via San Augustín. Well, I won’t see Alex then for sure. The road to there is fantastic even though in between a 35km piece of dirt road comes across. While I let the air off my tires Julian comes along with his 110ccm Honda and wants to help me. As everything is fine we drive together and reach Iznos where a gas station got fresh supply. And now probably more than 100 bikers are waiting for their refill. This takes too long for me and since Julian knows most of the people around I get 20 liters from a canister. Flecha is completely full and we can go for lunch before we visit the waterfall Salto de Mortiño. At the turn-off to San Augustín we say goodbye and I reach San Augustín in the later afternoon. In the hotel Valladolid I get a nice Cabaña for $35.000 (€ 10,-) incl. breakfast. And I get the chance to build up my tent again for drying. Perfect! The park – the only reason for visiting this village – is only 2km from here. After 200m a car stopped next to me asking me if i want a lift to the park. So kind! The walk through this park is very nice. Again and again it rains, but I like the smell of the nature combined with with the bird’s singing. Back in the hotel I fall asleep in a hammock before I go for dinner into a nice Italien Restaurant where I meet Philip, a swiss guy from Basel who lives here since 10 years and owns a coffee plantation. We talk until midnight and drink two bottles of red wine. Philip’s Finca is the starting point for the Mirador La Chaquira with a great view over the valley of the Río Magdalena hat. A challenging water passage stops me for a short time but was finally doable. After a tasty Cappuccino I’m leaving to Tierradentro via Garzón and La Plata. Here and there it starts to rain, then the sun comes out again. I get trained on taking my rain gear on and off:-) . The street is all in all really nice and diversified. In La Plata I get an ice cup. The ice cream is after a long time again really good in Colombia. The last 40km to Tierradentro are gravel but good to ride. In the hotel „El Refugio“ I get a nice room for $48.000 incl. breakfast and pool. Since yesterday my knee hurts again and so I decide not to hike through the park here but heading straight to Salento zu machen. During breakfast a horse wants to join me:-). Due to the rain the road is muddy and after a short time Flecha looks like a pig. Due to blockades which are still ongoing I have to take the way back to La Plante and then to Nieva. But the road is again a biker’s paradise. In Nivea I need a break. It has 39°C! Up to Ibague it goes just straight so I can make some kilometers in a short time. From Ibague onwards to Armenia the road is in a good condition but has a lot of traffic as it is the main connection to Bogotá. After almost 500km I reach Salento and get disappointed in the Hotel Posada del Café: no room available. Hence I land in the Hostal Rancho Alegre, which has a parking but the room no windows and on internet at all. Above all it smells of paint. After a breakfast in the street I decide to change the hotel and negotiate for a discount of 20%. I walk through the little streets, dring a fresh orange juice and take a Willie Jeep at 11.30 a.m. to the Valle Cocoa. If I knew that the road is in this great condition I would have taken the bike. At the entwanze I meet Gabriel, a tourist guide, with two ladies from Cali and we hike together for 5 hours through the cloud forest and see the famous wax palms. Even though my knee still hurts a lot it was worthwhile to do this trip which I never did without meeting Gabriel. After a perfect start in the morning the internet works and I can update the blog finally. Again and again it rains cats and dogs, so I don’t miss anything for the moment. This entry was posted in Colombia, Ecuador by Th. Buttgereit. Bookmark the permalink.